Students from 5 local high schools battled for the title of tournament winners in NLTG’s annual Interschool, held 5th – 7th March 2019. NLTG is one of the largest providers of Apprenticeships in the area and this is our 3rd interschool competition, held in celebration of National Apprenticeship Week. A Harry Potter ‘Triwizard Tournament’ was this year’s theme with students taking up the challenge of creating a themed feast including a ‘Sorting Hat’ creative cake, and an innovative ‘Quidditch Pitch’ display stand. New to this year, students were also challenged with writing and marketing a new Harry Potter short story. The Winners of the competition were Oswaldtwistle School who showcased their creative talents and teamworking skills. They received a school trophy and framed photo collage for the school, with each student receiving an iPad Mini. 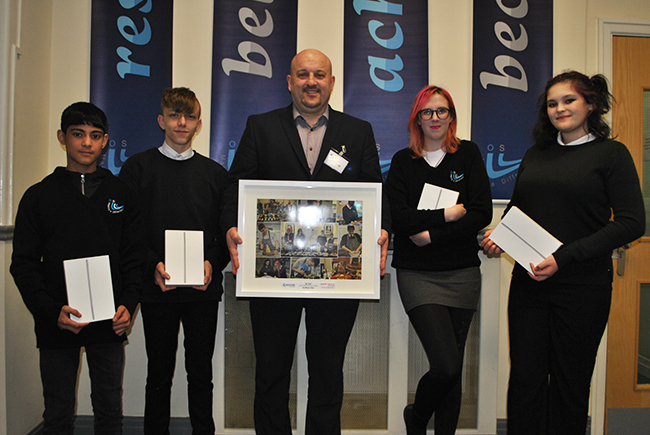 Students from Oswaldtwistle School receiving their iPad Mini’s and framed collage from NLTG Managing Director, Gareth Lindsay. Second and Third place went to Accrington Academy and Mount Carmel respectively. Each won Love2Shop vouchers along with a framed collage for the school. Coal Clough Academy and Witton Park Academy were the other two schools in the competition and also received a framed collage. All students went away on the day with a pack of NLTG information focusing on the real theme of National Apprenticeship Week, Apprenticeships.